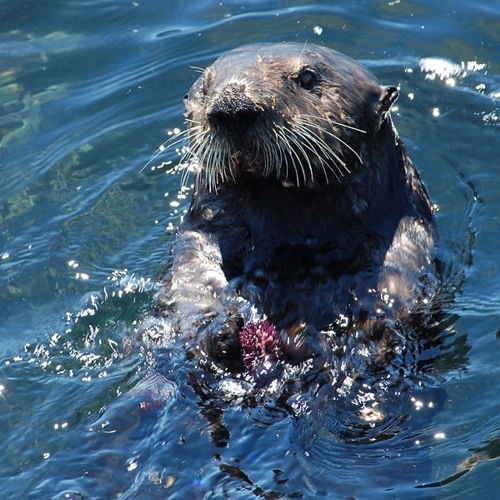 The sea otter is one of the very smallest marine mammals, and spends most of its life in the sea. Males weigh about 100 pounds and are about five feet long, while the females are smaller weighing about 60-75 pounds and measure just about 3-4 feet long. The sea otters have the thickest fur of any animal, with about 100 thousand hairs per square centimeter, and it was for this that they were hunted for about two hundred years. The Aleuts as well as the Russians hunted the sea otter for the vast insulating properties of their fur. The color is usually deep brown with sliver-gray speckles, however it varies from yellowish or grayish brown to almost black. 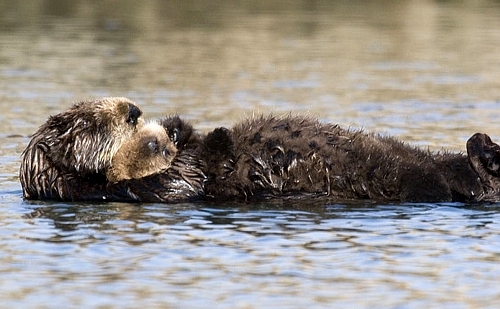 The sea otter has adapted to its fully marine environment in many ways. 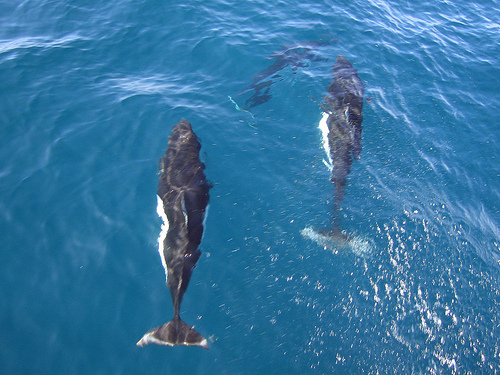 Their ears and nostrils can completely close, and their hind feet, which give them the most swimming propulsion, are long and flat and are fully webbed. Their tails are short, thick and flat. The sea otter swims underwater by moving the rear end of its body, including its tail and hind feet, up and down. On land, the sea otter walks with a clumsy rolling walk, and can run, doing so in a bounding motion. A sea otters body is very buoyant, which means that it floats very easily because they have developed a very large lung capacity. Nearly two times that of any animal of a size that is close to them. The otter has teeth designed to crush, not cut and its paws are sandpaper like to help them grip slippery objects to eat in the salty water. The sea otters metabolism is a lot higher than that of animals of its size also. It will run about two or three times faster. This is because of the vast number of calories that it burns in the very cold sea water, which help to keep it warm. The sea otter has to eat about a third of its own weight in food each day in order to stay alive in the cold environment. Different than most other marine mammals it also drinks sea water, that is to say, salty water, and can, using its super sized kidneys, get fresh water from the salt water and remove the waste products as very concentrated urine. Sea otters do not mate for life but may have multiple partners, however, temporary pair-bonding occurs for a few days between a female in estrus and her mate.
] Mating takes place in the water and can be rough, the male biting the female on the side of the face or on the muzzle and sometimes holding her head under water. From this, females often have scars on the nose. They give birth year round, although most happen in May and June, in the Northern polar regions, with January and March in the Southern populace. Their gestation seems to be about twelve months. This species is able to delay the egg implantation, and to be pregnant about four months after they permit the implantation. California species of sea otters will breed every year, while those in Alaska breed about every two years. They give birth in the water, usually to just one infant, called a pup, that will weigh about 6 pounds. Once in a great while twins do take place, however usually only one will live. At birth they have open eyes and a thick coat of fur, and the mother will float with them on her abdomen. The fur that they are born with is very thick and fluffy, to keep them warm. Mothers have been seen many times fluffing and licking it until the pup cannot dive but rather floats like a cork when it has been groomed. This fur stays about four months before it is replaced by adult coat. Babies nurse for about 8 months with the mother offering it bits of food after about three months. The otter pups have a very high rate of mortality, especially during their first year, and by one scientists estimate only about a quarter of them survive the first winter. Females take care of all the feeding and raising and are very famous for the level of their devotion to their children. They will give them nearly constant attention, cradling them on her chest away from the cold water and attentively grooming its fur. When foraging, she leaves her pup floating on the water, but will very often wrap it in kelp so that it cannot float away. In many cases if the pup is not asleep, it will cry out the entire time that it has been gone, and if a pup dies, the mothers have been observed carrying them for many days after their death. Mothers have also been seen caring for orphaned infants as well. i was doing a school report and I looked on here and I got so much information! I love this website!! hey my name is lexi i just wanted to know some things about you what state do you live in what school do you go to and what animal did you do for your report i am doing sea and river otter and orca whales. i am doing a school report on river and sea otters and this website told me alt more than the book i was reading i love this website for now on i am coming here. Sea Otters seem so rare i would really like to see one in Person!!!!!! !